— A plenary debate on the 10th and 11th of December (9am - 8pm) during which Member States will confirm their political commitment to the Global Compact for Migration. — Two dialogues on the 10th and 11th of December (10am – 1pm & 3pm – 6pm) which serve to pave the way for concrete avenues for implementation and partnerships at all levels and with all relevant stakeholders. Both panels will be interactive, and will have one keynote speaker, and three panelists. Note Verbale OSRSG – 13 November 2018 . The panel provides an opportunity for Member States to announce and kick-start practical efforts to implement the Compact at the global, regional, national and sub-national levels, in line with the implementation of the Sustainable Development Goals (SDGs) and other policy frameworks. This panel discusses how local authorities, the private sector, trade unions, civil society, academia, parliamentarians, national human rights institutions, the media and other stakeholders – including migrants and diaspora groups – can work together to support the implementation of the Global Compact and make migration work for all. 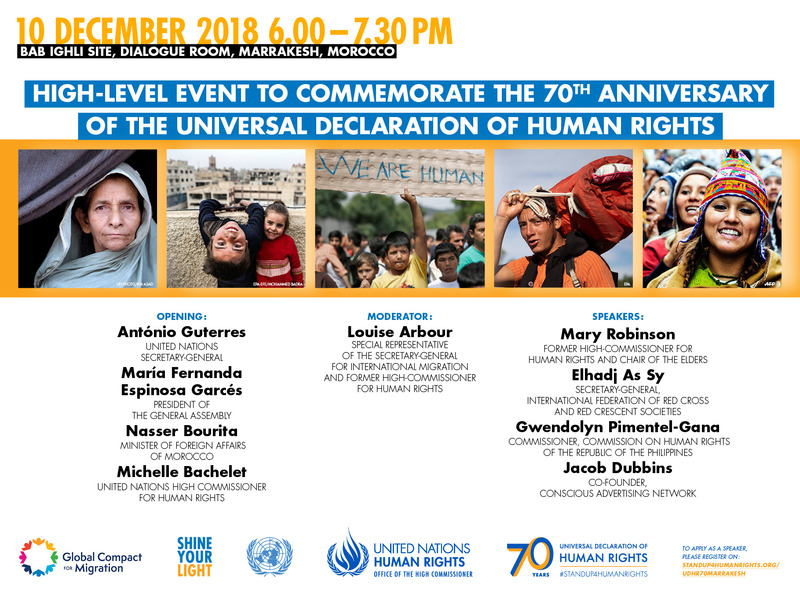 — High-level Event on the 10th of December (6pm - 7:30pm) to commemorate the 70th Anniversary of the Universal Declaration of Human Rights. The adoption of an inter-governmentally negotiated and agreed outcome, entitled "Global Compact for Safe, Orderly and Regular Migration," for which the negotiations shall be concluded by July 2018, in accordance with resolution 72/244.